Wouldn’t your precious little girl look even sweeter in this day gown when she gets dressed for her visit with Grammy? It is a simple – yet elegant – short dress, sporting sleeve accents of delicate lace, with baby piping trim around the yoke and collar. The front has a wonderful accent of embroidered ribbon trim flowing down the front placket; placket is closed with mother of pearl buttons. Your little darling will be comfortable – yet so adorable. 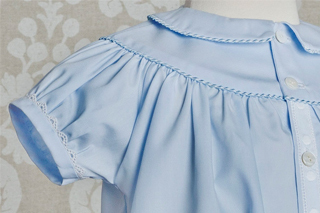 Wouldn’t this simply elegant design also make a special christening gown for your angel’s important day, when made in a white fabric? 100% cotton – Hand wash in lukewarm water, with a soft detergent. Air Dry. Press with iron on wool setting. 100% cotton batiste – Hand wash in lukewarm water, with a soft detergent. Air Dry. Press with iron on wool setting.